It has come to my attention the commenting system I've used for several years, Haloscan, is shutting down. I want to reassure everyone that your comments have been exported and saved. The problem is on Feb. 11th, or rather before, they won't be visible on the site. Unless you have a better suggestion, the only course of action I know to take is to switch over to Blogger comments and manually add your comments to each post. Seeing as there are over a 1,000 of them, it'll be a daunting task. As I said, I'm open to any suggestions to make the transition easier and faster but in the meantime, please bare with me. I'll keep you updated on this crisis. Thanks! Do you think a legend could ever die? Why or why not? Like many towns, Montague, NY has their very own local legend. This one involves a young woman who died in a fatal car accident. Anna Joan Machowski was born on February 2, 1917. Her life wasn't exactly a fairytale but little did she know, her death would be the fuel of legend and rumors for years to come. At the age of 24, she married a man named Alfred and gave birth to four children. Her marriage wasn't always the happiest and she often drowned her sorrows in alcohol. You have 9 days left to submit to the Ghost Stories Carnival February edition. Your submission must be in by 11 pm Central. Pick your best post between January 6th and February 1st and submit it. No registration required. Must be paranormal related. The Pyderrairme people were the traditional owners of the area. However, Port Arthur settlement in Tasmania was first established as a small timber station in 1830, replacing the timber camp at Birches Bay. The colony soon morphed in to a penal station housing British and Irish second offenders after arriving in Australia. It was advertised much like Alcatraz as an inescapable prison. And much like Alcatraz, convicts proved how arrogant they were. Many prisoners found ways to escape to freedom. You have 16 days left to submit to the Ghost Stories Carnival February edition. Your submission must be in by 11 pm Central. Pick your best post between January 6th and February 1st and submit it. No registration required. Must be paranormal related. In Western Kentucky, there is a national recreation area situated between the Kentucky and Barkley Lakes known as "The Land between Lakes" or LBL for short. This piece of land consists of 300 miles of shoreline, 170,000 acres of forest and 200 miles of walking trails. In 1963, by order of President Kennedy, the federal government used eminent domain to buy and tear down homes and businesses forcing 700 families out of the area known as "Between the Rivers". Over 228 family cemeteries are located throughout the area, long forgotten. White settlers, war veterans, large number of infants, black slaves, Chinese immigrants, and Native Americans lay beneath layers of Earth. Do you believe in demons? Why or why not? Much like the Gran Hotel Viena, Eden Hotel in La Falda, Argentina is believed to have a Nazi past. In 1891, a German hotelier named Roberto Balkhe came upon a vast and beautiful piece of land, purchasing it in hopes of building a grand hotel. With financial support, the construction began four years later. The Eden Hotel was completed and opened in 1899 and was considered the centerpiece of La Falda's tourist attractions as a luxurious resort. Lance Lee Noel attended the University of Missouri, where he excelled both in the classroom and on the field as a member of the Tiger football team. He later went on to achieve a Masters Degree from the University of Missouri in St. Louis. A Missouri native, he draws on his lifelong passion for history to make the details of Civil War era come alive. After touring American battle sites for more than fifteen years, he traveled to Lone Jack in 2006. When he heard the story of the battle, he knew this tale had the power to inspire a new generation of young adults. Thank you for taking the time to answer our questions. What inspired you to incorporate the Battle of Lone Jack in to a fiction novel rather than nonfiction? Welcome to the 2010 January edition of Ghost Stories Carnival. Ghost Stories presents Lemp Mansion posted at Ghost Stories. Emperor presents Corpse Wood Manor posted at Ghosts of Atlanta, saying, "About Dr Scuddle and the infamous Corpsewood Manor." 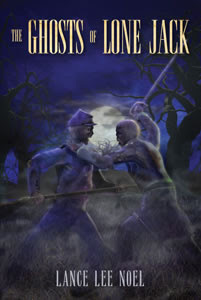 Jessica Penot presents Riverhaven posted at Ghost Stories and Haunted Places, saying, "This is one of many ghost stories told daily on the blog." This concludes the January edition of the Ghost Stories Carnival. THANK YOU for submitting your links! If you would like to see your work showcased in the February 2010 edition, please submit your links here. If Adolf Hitler's spirit is roaming the Earth, what location do you think he is haunting? TODAY is the last day to submit to the Ghost Stories Carnival January edition. Your submission must be in by 11 pm Central. Pick your best post between December 2nd and January 4th and submit it. No registration required. Must be paranormal related. If you are a devoted fan of SyFy's Destination Truth, you may have heard the story of the African Ninki Nanka. This legendary creature, depending on who you talk to, is believed to be a large reptilian, possibly even dragon-like. Some say it resembles its Chinese mythical counterpart. Others swear it possesses the body of a crocodile, the neck of a giraffe, the head of a horse with three horns, up to 30ft in length and breathes fire. One witness says it has legs. Another testifies to wings. While its appearance is up for debate, how dangerous it is perceived to be is not. Ninki Nanka has supposedly killed many in West Africa as recently as the 1990s.